148, Bear, grizzly, omnivore, daughter, and sister; b. ~ 2011 near Banff, Alberta, one of three offspring of Bear 122 (b. ?) and Bear 64 (b. 1989); d. 24 September 2017 near McBride, British Columbia. She was predeceased by her mother (d. 2013) and brother, Bear 144 (d. 2015) and is survived by her father and sister, Bear 160. 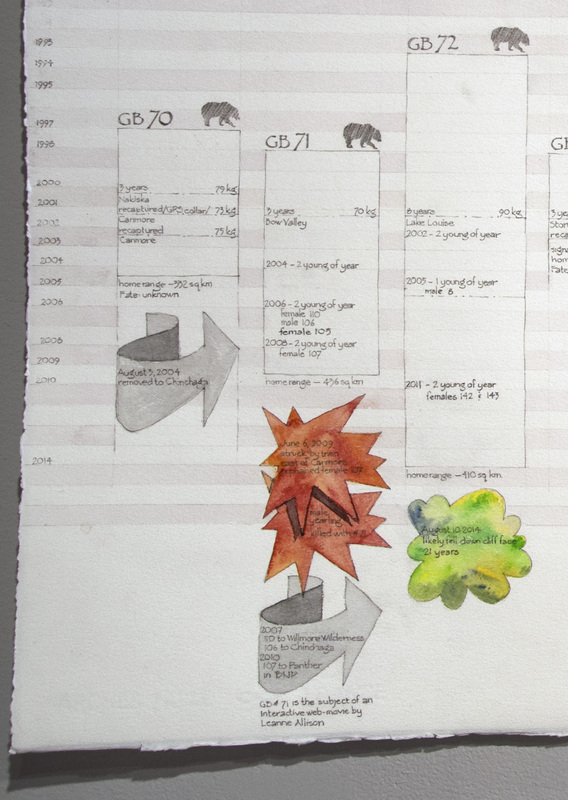 Detail from one of Colleen Campbell’s panels showing Bear 148’s history. Photo credit: Tina Loo. For most of her short life, Bear 148 lived in Alberta’s Bow Valley, near the town of Canmore, where she skilfully dodged runners, mountain bikers, and traffic on the Trans-Canada Highway. She was able to do so thanks largely to the lessons imparted by her mother, whose practised management of problem humans and their canine companions allowed her to live a full life and die a natural death. A well-known figure in the valley, 148 spent 90 per cent of her time in Banff National Park and had dozens of encounters with humans, many of them pleasurable to the latter. But in the months preceding her untimely demise, she took in a girls’ rugby game, bluff-charged a man with a stroller walking his leashed dog, and followed a group of hikers and their dog down Mount Norquay, as well as a woman kick-sledding behind the Banff Springs Hotel. Although none of these encounters resulted in physical contact with humans, much less any injury to them, 148 was forcibly relocated, first to the far reaches of Banff National Park and then, when she returned to the Bow Valley, to the Kakwa Wildland Provincial Park north of Jasper. Such moves are rarely successful, and this was no exception. Just two months before British Columbia’s ban on the trophy hunt was to come into effect, 148 crossed another line, that separating the park from Crown land and Alberta from British Columbia. According to reports, she was “legally harvested” by a trophy hunter. There was no investigation. We don’t think of wild animals like grizzly bears as having a history, but they do, and not just collectively and evolutionarily, but as individuals. That history – including 148’s – is revealed in naturalist and artist Colleen Campbell’s recent exhibit at the Whyte Museum of the Canadian Rockies which opened just weeks after 148 was killed. Panel showing that even after the Eastern Slopes Grizzly Bear Project formally ended, the animals continue to be monitored. Photo credit: D.L. Cameron, Whyte Museum of the Canadian Rockies. “Eastern Slopes Grizzly Bears: Each One is Sacred” isn’t just a work of art: it’s also a remarkable piece of environmental history, and animal history in particular, that tells the story of each of the animals in the Bow River watershed, some 89 in all, who were part of a scientific project that ran for ten years, from 1994 to 2004. Seeing it helped me think through one of our challenges as environmental historians: how do we craft compelling stories from specialized knowledge, stories that do real work in the world? It turns out that was a question that Colleen Campbell also asked herself. She was one of the fieldworkers with the Eastern Slopes Grizzly Bear Project. From the year before it started to the year after it ended, she tracked the radio-collared and tagged bears in the backcountry, alone, and sometimes overnight. The data she collected was used by researchers at the University of Calgary and Parks Canada to understand the impact of human activity on grizzlies in the “Central Alberta Ecosystem.” Encompassing Banff National Park and Kananaskis Country, it’s the most heavily developed area in North America where grizzlies continue to survive – although barely. The population is currently estimated to be between 60 to 80 adults. Her experience with the project stayed with her long after it formally concluded. 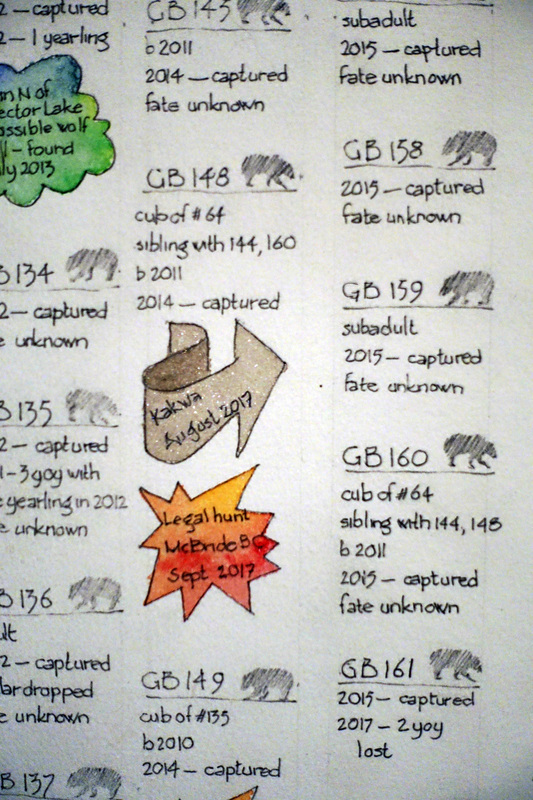 While Colleen was convinced the results deserved a wider audience, the challenge was finding a story in the record of locations and triangulations of 89 bears over a decade, data that was both dense and sparse. It was important to convey the animals’ individuality, as Sid Marty’s Black Grizzly of Whisky Creek and Leanne Allison and Jeremy Mendes’s virtual reality project, Bear 71, do. Colleen Campbell’s 12 years tracking bears, engaging the same ones over and over, convinced her that they had distinct personalities and recognized her as one too. But she also wanted to convey their collective experience, to express its diversity and its mystery – at least to us. Despite the collaring and tagging, and despite the trail cameras now in use, there’s still lots we humans don’t know and never will know about the animals. As much as we impinge on them, their lives aren’t subsumed within ours. One of the panels in Colleen Campbell’s show. Arrows indicate translocated animals, red stars indicate deaths deemed unnatural, and yellow-green clouds indicate deaths deemed natural. Left-facing bears are male, right-facing bears are female. Photo credit: D.L. Cameron, Whyte Museum of the Canadian Rockies. Although she tried, writing couldn’t tell the story she wanted to, one that was both individual and collective and spanned time and space. 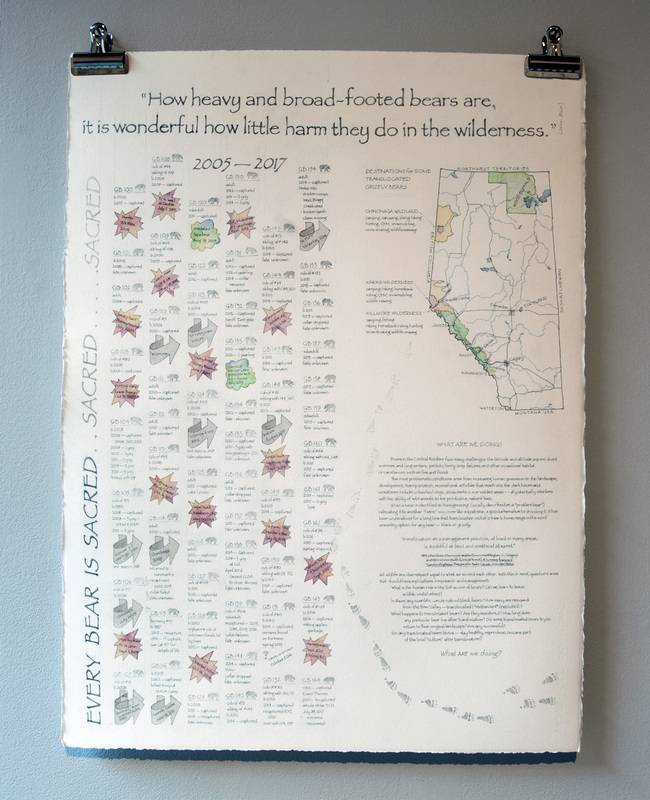 So she turned to her training as a visual artist, producing a piece that details the life history of each bear as it was recorded by the Eastern Slopes Grizzly Bear Project, when it was first tagged or collared, subsequently handled, and in the case of females, whether there were cubs. We also see what the ultimate fate of each bear was at the close of the project. 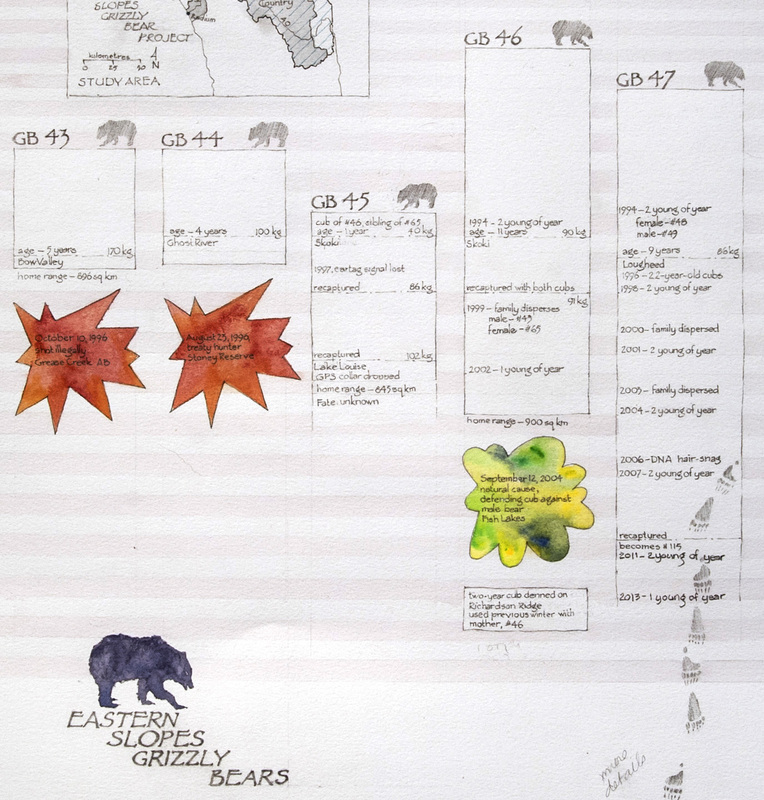 Importantly, the piece captures the gaps, where bears disappear from our view – perhaps because their collars failed or because they did – and if and when they reappeared. It wraps around the walls of the gallery, something that on its own conveys the scale of the project and the population concerned. Detail from the panel above. Photo credit: D.L. Cameron, Whyte Museum of the Canadian Rockies. Detail from another panel in Colleen Campbell’s installation. 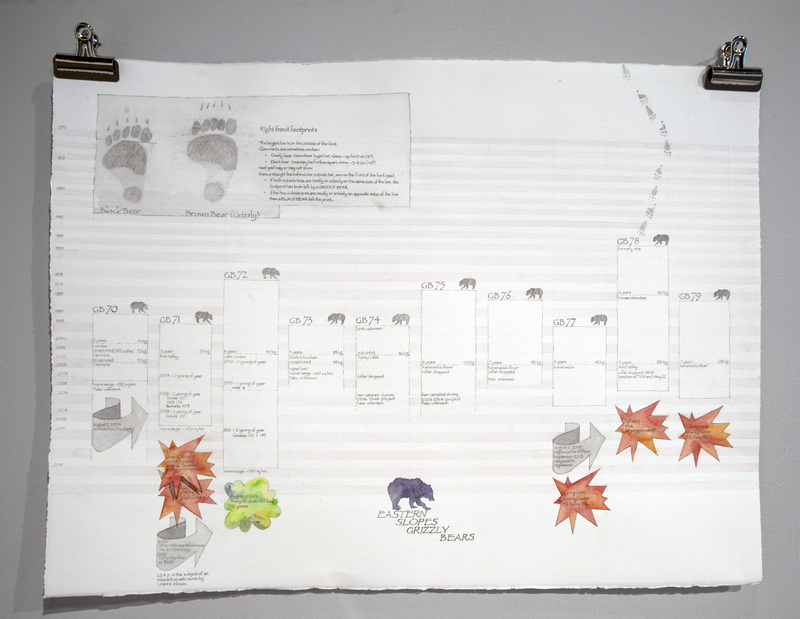 Footprints leaving the page indicate a bear that was captured and subsequently renamed, and whose history can be followed on another page. Photo credit: D.L. Cameron, Whyte Museum of the Canadian Rockies. Colleen’s work begins to do just that: by revealing our entanglements with the non-human – grizzlies in this case – and the world that’s been made as a result, her multispecies visual history lets us see and ask, as she does, what are we doing? What kind of world do we want? For further information on “Eastern Slopes Grizzly Bears: Each One is Sacred” or about Colleen Campbell’s other work, please contact her directly at kumakuma@telus.net. Colleen wishes to thank Anne Ewen, Curator of Art and Heritage at the Whyte Museum for seeing the merit of her work and showing it.